We are trying a fairly unique method for air-sealing this house. If you are interested, details follow below. The need for very good air-sealing is well established, and is generally considered more important than simply increasing insulation levels. There are many approaches to air-sealing - the Airtight Drywall Approach, PERSIST, Taped OSB , Flash & Batt, just to name a few. And all of them have their positives, and negatives. With this house, we saw the opportunity to try out a new-ish approach. - Use the WRB (water-resistant barrier) as the air sealing membrane. 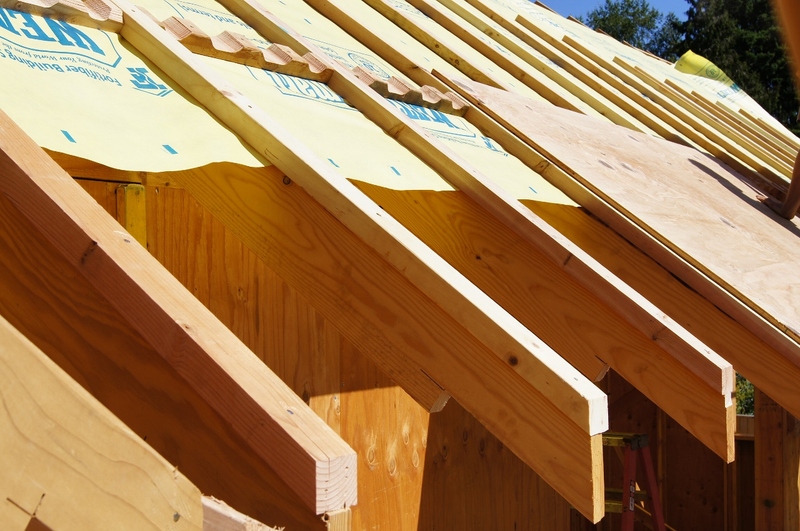 - Keep the WRB continuous over the roof...under the roof sheathing, to create a vented roof. We stretched the air-barrier/WRB membrane directly over of the roof trusses. Then we add a layer of 2x3 furring and vented blocking. 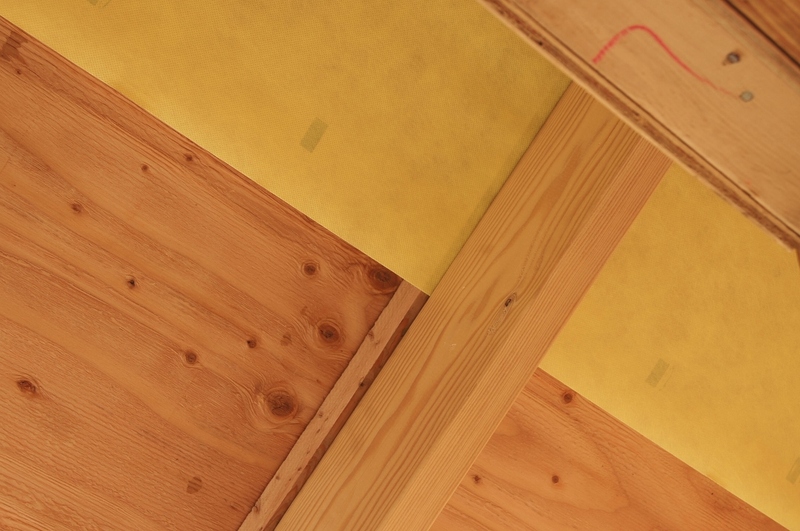 Air barrier sandwiched between roof structure (trusses) and 2x furring strips, with plywood sheathing on top. You can see that the 'taught stretch' was not perfect. 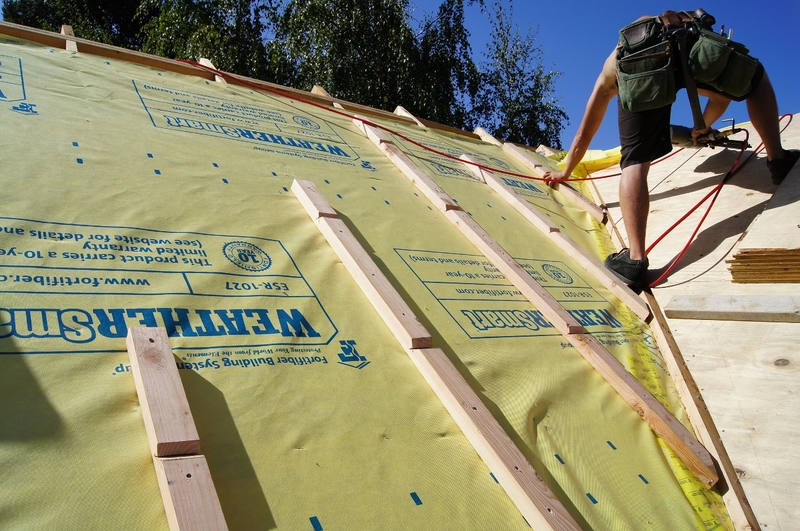 This creates a vented cavity between the membrane and the roof sheathing, without interrupting the air-barrier. The guys did a darn good job of applying the layers without issue. 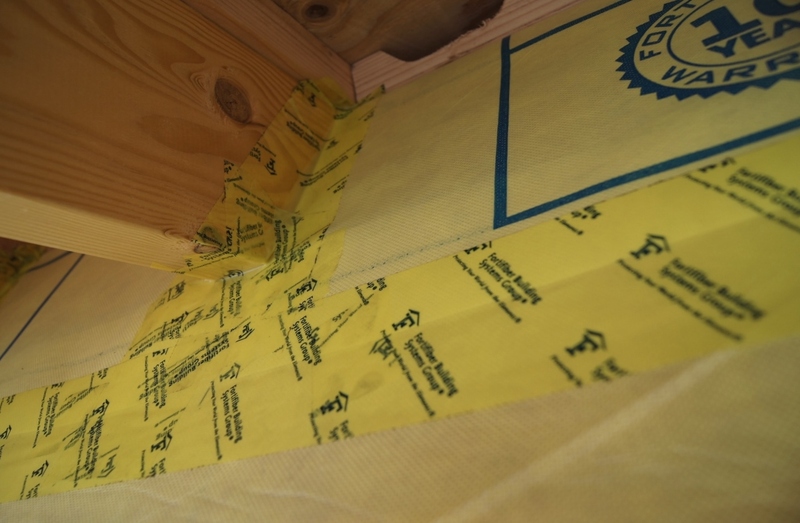 The air barrier can then also serve as a retainage membrane for the roof insulation, while also protecting it from air-washing, and keeping the air-barrier uninterrupted. The construction of the system went surprisingly well. I started out confident in the simplicity of the approach, but grew more and more worried about implementation as the day grew closer. Woke up more than once concerned about the details of installation. The guys on the crew managed it with seeming ease. Connecting the roof membrane to the wall membrane has been the fussy part. Seam taping around each rafter tail. If there were no overhangs, then this method would be simple. Roof overhangs mean that the projecting rafter tails are in the way of simply folding the roof membrane down and taping it to the wall membrane. What I have to do is cut the roof membrane around each tail, fold it down, and tape around all the seams and corners. That part is a bit fussy. But it isn't difficult, just a monotonous task high up on a ladder. Since I'm doing the actual taping, and I care more than the average laborer about quality implementation, I am fairly confident this approach will be successful (we'll see). A vented roof is a robust, excellent approach with many benefits. Dr. Joseph Lstiburek from Building Science Corporation sings it's praises - when done correctly - as "probably one of the most unappreciated building assemblies we have in the history of building science. It’s beautiful." This decouples the heated roof from the rest of the building, significantly decreasing the heat transfer into the spaces below. This also ensures that the condensation moisture that might accumulate on the sheathing dries readily. - The air-barrier up at the roof plane is out of the way, freeing up the ceiling below for lighting or other penetrations, or dropped ceilings with conditioned attics. Our ERV is located in one of these conditioned attics. - It acts as the baffle/retention membrane to hold our roof insulation in the sloped truss cavities. Our scissor trusses create a nice vaulted ceiling, but make it hard to insulate on the sloped surface. This way we have encapsulated the trusses top and bottom, and can just fill the cavity with loose fill insulation. - It allows the deep insulation to dry to the outside (vent cavity) if necessary. - Exterior air-sealing of the WRB is just a little more effort added to a task that is already being done. One must simply tape the seams of the WRB, and make sure the seal at the foundation is carefully managed. It is a lot of work, but so is any other effective approach. Interior air sealing (drywall) is popular, but is notoriously hard to get very good results. Every electrical outlet, light switch, pipe, trimwork gap, etc. must be sealed. There are quite a lot of these, and they are hard to seal well. Why is this not an ideal approach? 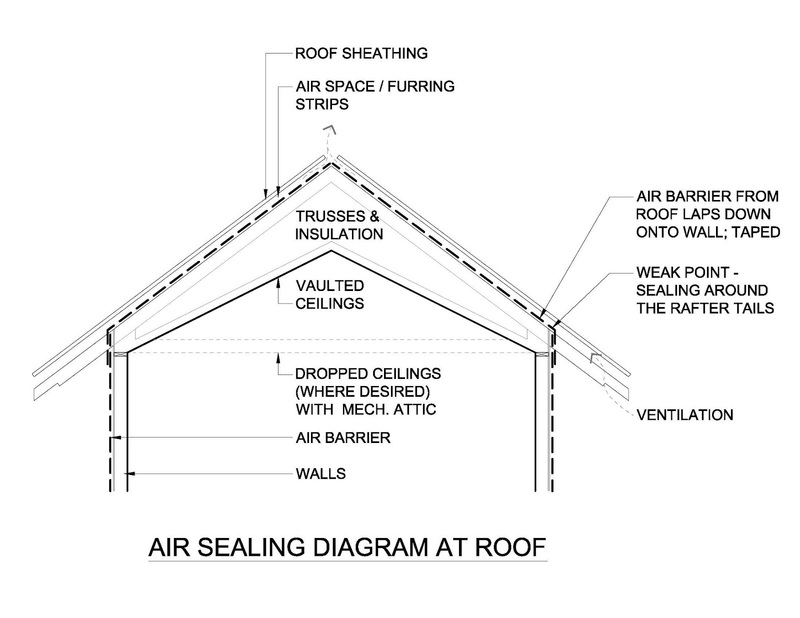 - It requires careful attention by both the persons doing the sealing, and the persons working around the air-barrier. Construction activities are rough-and-tumble, and even a crew who "cares" can damage the membrane in the course of their work many times. Ladders scrape, nails and staples penetrate, rips happen. The staples or cap nails to hold the membrane in place, the nails from the siding and numerous other attachments. There are a LOT of tiny little holes. We are patching the ones we can get to, and hoping that that the ones created by a sandwich of attached lumber will be relatively self-sealing. We are not really sure how much these will add up. We shall see - the blower door tests will be illuminating. - Not all WRB's are air-barriers. Check the literature carefully for the ratings. Originally, I had hoped the WRB would be a taught enough membrane to contain the pressure of dense-pack cellulose in the truss cavity. After installation, the membrane is pretty taught, but not quite enough. The 24" spacing we used for advanced framing might be too much distance to span; it would be interesting to see how 16" centers fare.